15 Llandogo Village at St. Oudoceus Church, Llandogo01633 644850work Walking RouteThe route starts at the church and the follows the River Wye upstream for just over 1km. It then follows the road back towards Llandogo for a short distance before turning right and starting a gradual ascent up into the woodland. The path emerges high above the river, amongst the old lanes and houses of the village. After crossing the Cleddon Shoots the path descends through little lanes and footpaths back to the church. 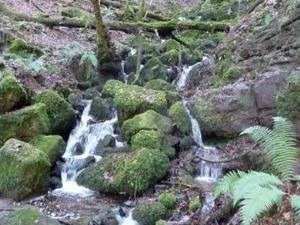 Points of interest include the River Wye, Cleddon Shoots waterfall and stunning surprise views. The route starts at the church and the follows the River Wye upstream for just over 1km. It then follows the road back towards Llandogo for a short distance before turning right and starting a gradual ascent up into the woodland. The path emerges high above the river, amongst the old lanes and houses of the village. After crossing the Cleddon Shoots the path descends through little lanes and footpaths back to the church. The Sloop Inn, Browns Stores. Limited parking on lane outside the church and Browns Stores. Lots of steps and some very steep sections.